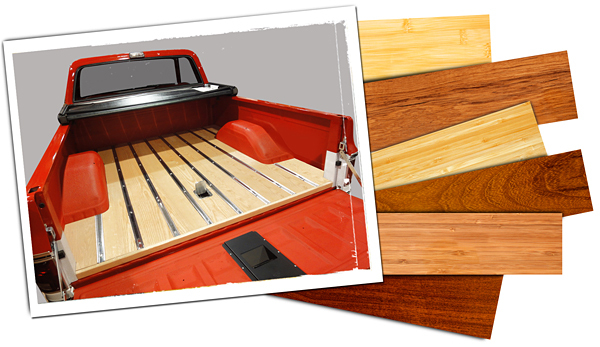 Hopkinsville, KY—November 1, 2011— Bed Wood and Parts has developed a complete BedWood™ kit that will outfit any modern truck with the quality and good look of wood. The RetroLiner™ is available for most pickups, SUV’s, Crossovers and the muscle car era El Camino and Ranchero. The kit is a complete system that requires only one tool (included) and requires no cutting or drilling. The RetroLiner converts any metal truck bed to a classic and durable wood surface, without damage to the original steel. Each of the RetroLiner kits are custom built to order and precision cut to exacting tolerances. Made in America and constructed for the utmost in style and durability, BedWood for Trucks ensures that every kit fits perfect by employing state-of-the-art computer aided design (CAD), 3-D modeling and digital measurement procedures. “We take the pride and quality of yesteryear and combine it with today’s technology. The combination creates a product that is unsurpassed, and we are proud to brand BedWood for Trucks,” says Jeff Major, president of Bed Wood and Parts. Early trucks always utilized wood plank beds, and when technology allowed the manufacturers to stamp the beds from steel, that look of quality and the hand-made feel was gone forever. The RetroLiner brings back both the aesthetic beauty of wood and that sense of craftsmanship. BedWood for Trucks offers the RetroLiner in a variety of over 40 exotic and domestic woods. The wood is kiln dried, stabilized and pre-cut to fit over 200 late model applications. BedWood for Trucks can also make a custom RetroLiner for virtually any vehicle. A four-stage sanding process is utilized to create an even and ideal surface, which is ready for finish. The kits are furnished with stainless steel bed strips and hardware, as well as mounting pads and subframe. Installation is made simple with comprehensive instructions and tips for care and maintenance. The RetroLiner offers the consumer with a later model vehicle a classic wood bed. BedWood for Trucks also manufactures a complete line of custom and restoration BedWood kits for virtually any truck ever made.